I've been thinking a lot about what it means to "heal" lately. Does it happen just after a trauma? Is it reserved for specific physical circumstances? Does something "big" have to happen in order to validate the healing process? How do you heal the repetitive negative patterns going on in your mind? In your body? Can healing serve as preventative care? What I do know about the healing process is that it takes TIME. Effort. And, it usually is helpful to have a support system in place. People like therapists, yoga therapists, a trusted friend, a partner, a parent, a doctor, an acupuncturist, a yoga teacher, a spiritual teacher, etc. can be tremendously helpful in facilitating and guiding your healing process. Emphasis on guides. At some point, YOU have to learn how to listen as your body speaks. YOU have to do the work of learning to go within, slow down, ask yourself the right questions, get still, and listen for the answers. And, this is in direct opposition to our culture. 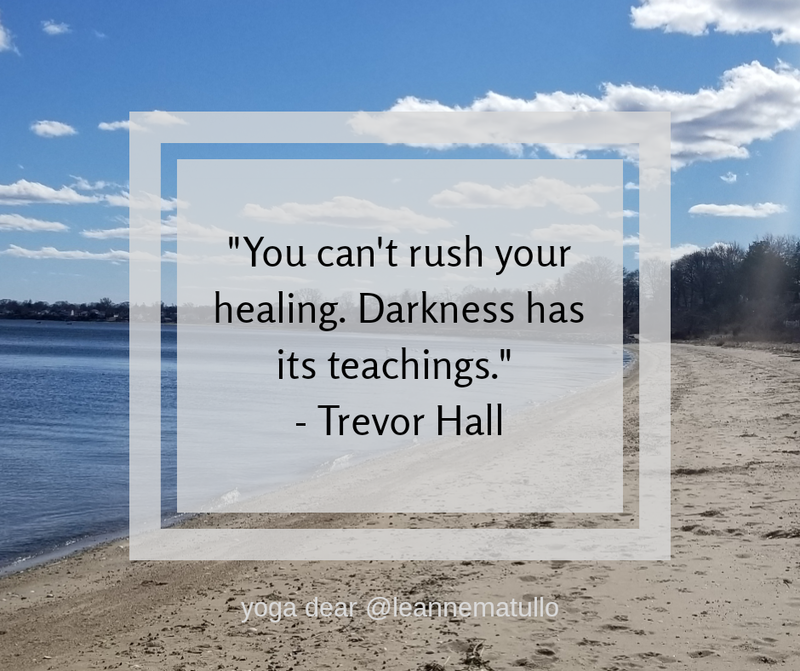 We often (though not always) want quick fixes and band-aids so that we can go back to “doing” at what we don’t even perceive to be warp speed, avoiding our pain and traumas, and by doing so we never actually heal. We never actually find wellness. We never actually get to the root causes of what made us unwell in the first place, and so the cycle will continue. And, your variation of yoga doesn’t have to look like Instagram or YouTube either. You can practice Restorative Yoga, only doing five poses in an hour with the support of props like pillows, blocks, blankets, bolsters, and neck rolls to allow yourself to really relax. You can put on music and light a candle, roll out your mat, and simply move to the rhythm of your own heartbeat. You can use yoga therapy balls to roll out the fascia and tissue in the arches of your feet, IT bands, shoulders, the upper chest, hips and low back. You can choose a more vigorous practice followed by a 10 minute savasana. Whatever you do, focus on your healing, rather than your “fitness” if healing is what you need. Focus on what is happening within your body from the inside out. How does it feel? Where is the tightness? Where do you contract? What are you holding on to or guarding? So much is stored in the body. Memories, pain, trauma. I'm learning to move it out and, through my own self study, how to help others move it out, too. But, this won’t happen in a day or even a week. Your healing will likely take time. I’m still thinking and studying about the questions on healing from above, but I have a few thoughts to bring this full circle. Trauma is a word with a wide range of differences. What might be “trauma” to one individual may not be to another. And, because of this variability, some of us push aside our experiences as not a trauma, and healing doesn’t begin as early as it could. Healing isn’t only reserved for the physical body. Your feelings matter. Honoring them matters. And, often those emotions can affect our physical state of well-being. Healing your emotional layer is a recognition that you are NOT broken, but that you’re hitting some bumps along your journey and may need support to remind yourself of your wholeness. Experiencing our bodies and reconnecting with them is a gateway towards allowing ourselves to heal. Movement (but not always vigorously), breathing, and meditation combined with other modalities (talk therapy, acupuncture, seeing a doctor, getting into nature, etc.) can be wildly effective in your growth and well-being. I imagine this is the first post of more to come on what it means to heal, and how we can begin to facilitate our own healing process. Try reconnecting with your body as a start. Gather a support system, but know that it’s only YOU who can really know what you need. Your body is a gateway to the answers that are buried within your being. And, it is already speaking to you. Know that this process is not a quick fix, but it’s more sustainable in the long run. Let’s begin our healing journey there. Yes? P.S. I’d love to hear how this resonates with you, especially as I continue down this path in yoga therapy. I look forward to sharing how we might work together in a yoga therapy capacity, working towards healing using a combination of movement and yoga postures, breathing techniques, meditation, and talking about whatever needs to come up in the moment. And, I’d love to answer your questions about yoga therapy, too.